The kids received a gigantic trampoline earlier this year and we have been having the greatest fun with it. Coming up with trampoline games has become our new favorite past time. With summer coming we are all excited to try out our hand at fun trampoline games for all our summer parties and some even include water! Water obviously makes every jumping game that much better. Here is the trampoline we purchased and it is the perfect size for our bigger 9 year old kids. If you have the space and budget for it, having the 14 foot version with the net is great for older kids. It gives everyone the room they need to play all these fun tramp games and it ensures safety is first… although obviously fun follows up as a close second. Here are our 10 favorite trampoline games that will get your kids jumping with their friends all summer long. On multiple occasions we’ve filled it with balloons and $3 bouncy balls from Target. It has been a hit! The combination of jumping and bouncing balls has given us hours of enjoyment and has made get togethers with friends that have kids really great. Simply fill the trampoline with this and then have everyone jump and try not to get touched by a ball or their out. Everyone jumps and says rock paper scissors shoot, just like the hand game. The kids land curled up as a rock, splayed out as a paper or in a V like scissors to see who wins. Everyone jumps and one person lands on their bottom. Then the next jump the next person has to land on their bottom, taking turns in the row. Everyone keeps jumping and going around landing in order. If anyone lands on their bottom out of turn they are out. This trampoline game can be played with 3-8 people and brings hours of fun. This is basically trampoline dodgeball and the boys especially love it. Really any childhood favorites can be transformed into trampoline games for even more fun. We make this crossfire game a little more fair for the young kids by using balloons in place of a ball. Throw the balloon and everyone jumps to get out of the way, if you get tagged it becomes your turn to throw. Since it is summer we tried our first hand at bouncing water balloons. The crazy thrill of the popping and bursting balloons has become a late evening summer favorite. Although we’ve had to watch the little ones closely when they jump with water balloons. We always put the big net up and make sure the trampoline doesn’t get too wet for them. It has become the coolest game in their little world. And of course, we adults had to try it out, too! The adults have taken over the trampoline after bedtime a couple nights in a row. I haven’t had this much fun bouncing in years. It is exactly the kind of shenanigans summer is for. 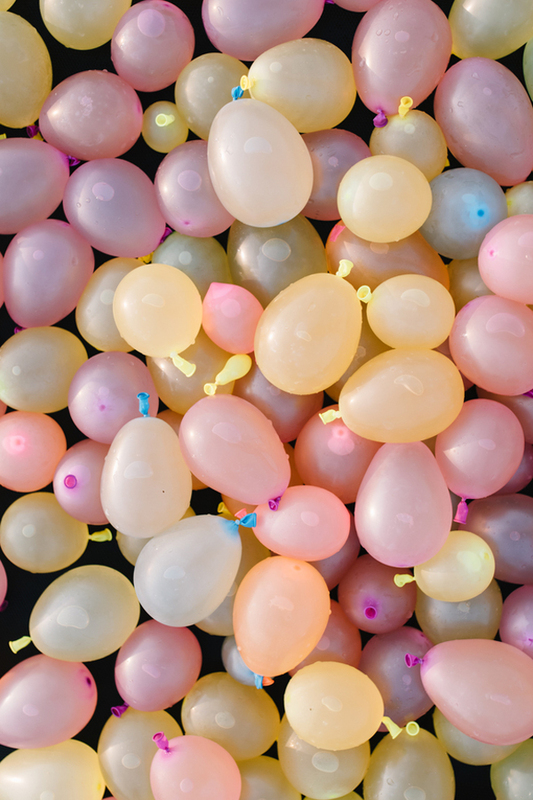 Here are a few other crazy awesome things to do with water balloons: Have a surprise water balloon fight | Make water balloon ice cubes | Engage in water balloon painting | Have the best batting practice ever | or make a set of flower bud vases with water balloons – find the full instructions in our book Materially Crafted. 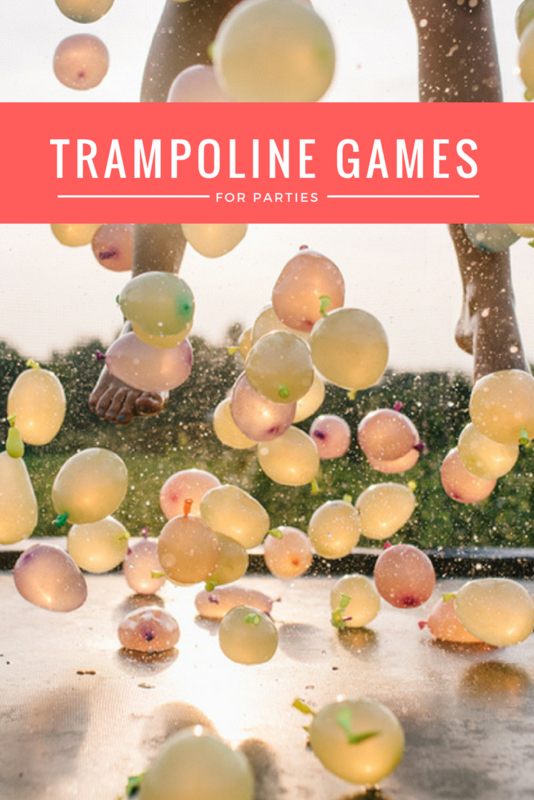 Another one of our trampoline games that is perfect for summer parties is the the spray and wash.
To create this game, set up the sprinklers underneath the trampoline. Hand the kids large sponges that you can get from the dollar store and every time they jump they have to touch a part of the bottom of the trampoline with the sponge. The kids love this one as it gets slippery and fun really fast (best to do only if you have a net around your trampoline) and I love it because the tramp gets washed as they play! This trampoline game is a favorite for any age group. One kid sits in the middle with their arms and legs all curled up like and egg, while all the others jump around (but not on top!) of them. They are trying to crack the egg and as soon as the center player breaks their hold and comes undone it is another kids turn to be the egg. We hosted a party last fall and brought all our leaves from around the yard onto the trampoline. I’m not going to say it was the best day ever… but leaf jumping has never been more fun! Stack them high and let the kids go to town. Have everyone stand around the perimeter of the trampoline and one person does the old fashion telephone game to the next, sharing a trick they must do. The person does the trick (or at least what they understand the trick to be) and then passes it down. This keeps going as the initial trick just gets funnier and funnier. Once you’ve gone around fully, the first person shares their actual words and another round starts with the next in line. This last one is probably my favorite of the trampolines games list, although I’d like to say that about every one! Purchase a trampoline tent, these are so cool! Or set up your own tent on top of the trampoline and camp out. If your backyard is safe, this can be a fun family activity for an summer evening. Otherwise set it up for the day and have nap time, lunch time, all the time outside! The kids LOVE bringing all their favorite things to their camping site and will literally spend hours outside doing this all summer long. What trampoline games do your kids love? Our trampoline was easily the best investment we every made for the kids. (This post has been updated to include more of our favorite trampoline ideas. 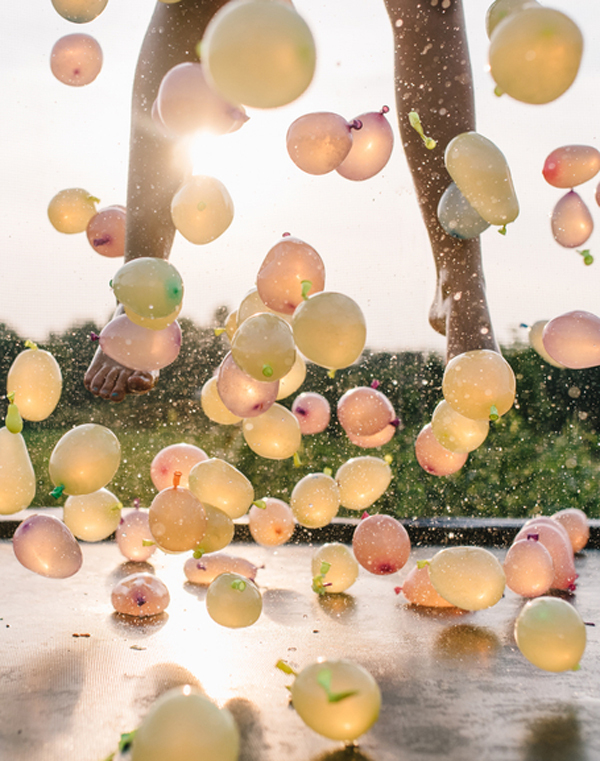 Water Balloon Photography @Melanie DeFazio/Stocksy United). This is such a great idea! I am gonna keep this in mind for summer! Cause the kids I work with, will love this! That’s awesome. I would love to experience this with my kids who just love to jump on our trampoline. 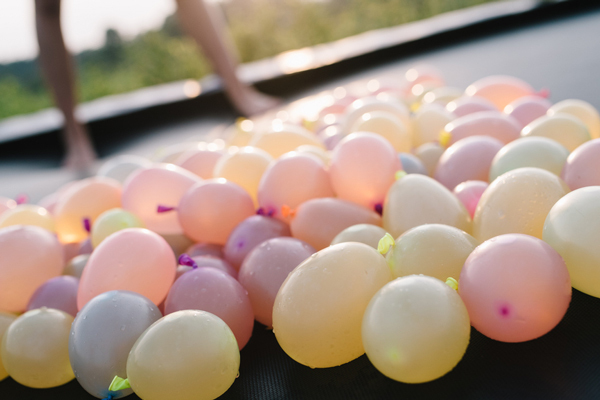 We usually put the sprinkler under the trampoline, but water balloons sound fun! Definitely going to do it this summer! A pediatricians nightmare. Not to mention, most home owners insurance will not cover accidents on trampolines. Wow it looks like a lot of fun! What a fun an unique way to entertain the whole family! Water balloon! My kids enjoy this. Even I enjoy this. Especially in summer days it adds a lot of fun. Wow, just found this article and that’s a cool idea! Jumping on a Trampoline in the Summer and adding Water, what more do you need in life? ;) We’re going to try this undoubtedly! Thank you very much! Whoah, thats a cool idea. I need to try this sometime, thanks for the idea! im going to do some online shopping so when summer arrives I’ll be ready to do this!